This 16 room hotel has been one of my favorites for years now. Although I will say it has no A/C in 15 of the rooms I have never heard any of my clients mention this as a problem. The hotel is on a lake, it is very small but spread out perfectly almost with the feel that you are in a large plantation home arriving in on a driveway of a long row of palm trees. The pool area is small but very well kept along with all the hotel grounds. You are located in a valley and have very good views of the mountains and nearby Turrialba Volcano. The area is also very close to some of Costa Rica's best rafting rivers and Costa Rica's most famous and world renown the Pacuare River. The food is amazing and if I had to give this hotel one bad comment it would be the coffee is not my favorite but just go with the tea for a night or two. Who will Enjoy this Hotel? I will let my past clients do the talking on this one as we have been working with this hote Casa Turire for around 5 years now and we have a 100% satisfaction rate with this hotel. The prices are also very low I feel for the value and service. 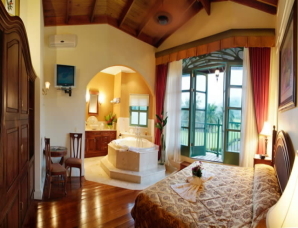 This hotel works perfect for family vacations and also an amazing spot if you are on a Costa Rican Honeymoon.